Over the summer I did a fair amount of research on Irish travel writing for my exhibit and I quickly learned that you simply cannot discuss Irish travel writing without mentioning the Halls. Samuel Carter Hall (1800-1889) met Anna Maria Fielding (1800-1881) in 1823 and they were married in September of the following year in London. Although both had been born in Ireland to Anglo-Irish families, they pursued their careers in England. Samuel Carter was a journal editor and writer who participated in a dizzying array of activities from 1823 to 1830, at which point he suffered a brief nervous affliction. He soon recovered and rejoined the editorial game, eventually finding some level of stability as sub-editor/editor at the New Monthly Magazine. Anna Maria’s career as a writer took off in 1829 with the publication of her first book, Sketches of Irish Character, which contained reminiscences of her childhood in Ireland. She subsequently published a number of children’s tales, novels, plays, essays, and more Irish stories. 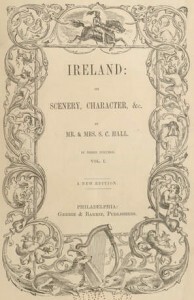 Title page from the Halls’ Ireland (1860s). Falvey Library’s Special Collections owns two multi-volume editions of the Halls’ Ireland (from the 1860s and 1911), as well as two of their regional guides, and I used all of these in my exhibit. “Rambles, Sketches, Tours” features eight images from the Halls’ works—can you find them all? Hall, Mr. and Mrs. S.C. Ireland: its scenery, character, &c.. 3 vol. Philadelphia: Gebbie & Barrie, [186-?]. Laura, that exhibit link is slightly borked.